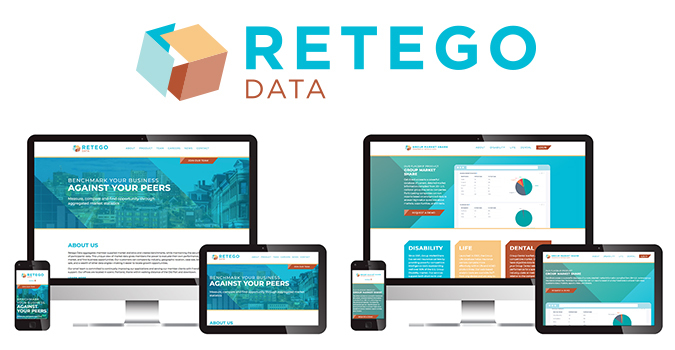 We just celebrated the launch of another new website and a new brand, this time for Retego Data. 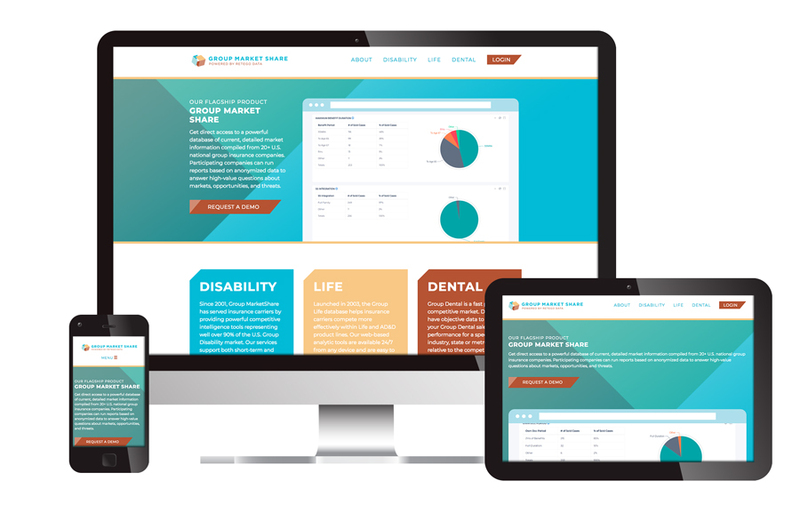 Retego, previously known as Group Market Share, is a Portland-based company that aggregates insurance information so that clients can make informed decisions regarding their products. Founded over 15 years ago by Fred Brown, Jason Cianchette purchased the company in 2017 and one of the first priorities was to update the company’s identity. Visible Logic stepped in at this juncture. Like many software companies, Group Market Share used the same brand name for their flagship product and the company itself. It is not uncommon for software companies to start this way and then outgrow this relationship. Holding several meetings with the Group Market Share team, the decision was made to transfer the name ‘Group Market Share’ to the company’s flagship product, and rename the company itself. Visible Logic drove the renaming effort. After several rounds, and working closely with their small team, Retego Data was born. Retego is Latin for open, uncover or disclose. The name draws from the fact that the Group Market Share application allows insurance companies to share market information in a secure way. Visible Logic next designed logo concepts that would reflect the same traits as the name: an opening or disclosing of data, but in a structured, secure way. While the Group Market Share product is focused on specific insurance product lines, the company could use this same technology—a web-based data mining system that has the ability to allow for in-depth queries of submitted, anonymized data—in many other potential markets as well. This was reflected in the final logo design that gives a containing structure and of pieces of information that work together to form a whole. 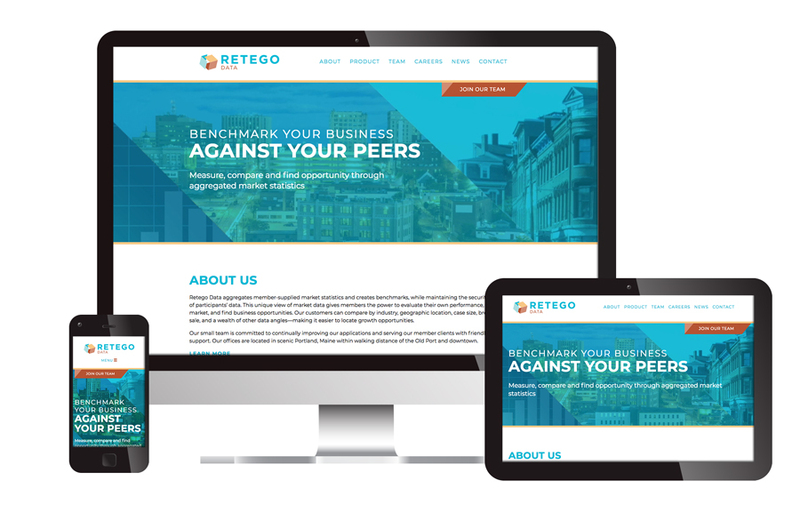 Visible Logic then designed new websites: one for Retego Data the company, and a separate product website which took the place of the existing Group Market Share site. The new sites are easy to navigate and connect visually. Both sites have the same color scheme established in the logo, with the Group Market Share product site adding a ‘Powered by Retego Data’ to the logo. The corporate site is focused on employee recruitment, highlighting their location in the heart of Portland, Maine by placing a map on the home page and using photos of Portland throughout the site. Current and potential clients use the product site with application-specific information including direct access to login to the web-based application. The software-focused site was built directly into their application based on design files provided by Visible Logic. The corporate site was developed in WordPress by Visible Logic and will be easy to expand as their product line grows. Both sites use video animation to draw viewers into the site. With a separate name for their company, Retego Data is now poised to be able to expand into markets outside of insurance using their same technical insight but without the connection to their insurance-focused application.